Lemon chicken is a very tasty meal to prepare for your family dinner. Some people think it is a daunting recipe to follow when in essence it is very easy to prepare. Served with either rice as part of an oriental meal or with seasonal vegetables the lemon sauce will soak into to suit any accompaniment. Wash any lemons that are used as quite often they have a wax coating. It is possible to purchase a lemon that is suitable for cooking with but even so give them a wash with warm water before cooking. Also try to make sure that the pips or too much pith goes into the recipes as it will make your family dinner quite bitter. You can either leave the skin on the chicken or remove it. As this recipe is roasted in the oven sometimes it is better to leave on the skin so that it roasts and looks good. The choice is yours. To take the skin off a chicken piece use kitchen paper or a clean tea towel to grip the chicken as it is easier to remove this way. You can also piece the chicken so that the lemon works its way into the meat right down to the bone. Heat your oven to 200ºC gas mark 6. Brown chicken pieces all over in the oil and place in a large roasting tin. Cut three of the lemons into quarters taking care to remove the pips and place in the roasting tin. Add quartered onions, and carrots. Cut the zest from the remaining lemon and scatter over the chicken pieces. Then add the lemon juice from the lemon. Season and place in the oven for one hour. Check after 45 minutes and add a little water if the baking tin is too dry. Check that the vegetables are not browning too quickly. Add the button mushrooms and return to the oven for the final fifteen minutes. Check that the chicken is cooked thoroughly and serve. Whatever accompaniment you are using make sure that the cook time coincides with the finish time of the lemon chicken so that your dinner remains hot and ready to eat. Some people like to have a little sauce with their lemon chicken in which case add a paste of two teaspoons of corn flour to a little water and add to the roasting tin. Heat this on the hob until thickened before serving the chicken. 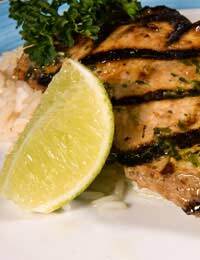 A quicker lemon chicken recipe for a speedy family dinner is to use diced chicken pieces. Brown the chicken in a little oil on the hob before adding a chopped onion, three quartered lemons, a little water, a chicken stock cube and simmer for thirty minutes before adding your button mushrooms. Thicken either with corn flour or gravy granules, season to taste and serve.